Is Fever In Babies Alarming? Check the sign here - fever in babies is worrying. But do not panic, first recognize the symptoms of fever in infants with this step. If the baby is less than 6 months old, use a rectal thermometer because the baby's ear canal is small so body temperature is not accurate. At what temperature does the fever in the baby? If fever occurs in infants under 3 months, contact your pediatrician as soon as possible. 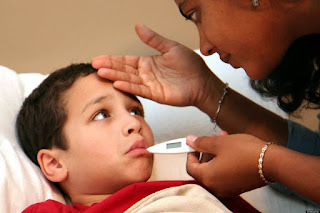 Because fever in infants aged 3 months and under can mean serious infection. AAP recommends visiting a doctor if the baby is 3-6 months old with a body temperature of 38 ° C or more. While in infants older than 6 months and temperature 39.4 ° C and up, immediately take it to the doctor. Pay attention to other symptoms. If the baby loses appetite, coughs, signs of an earache, unusual drowsiness, diarrhea, or vomiting. Although the temperature of the fever is not too high, he is not like himself, call a doctor. Mother's instinct is best to know if your child is really sick or not.